Hide Folders is a tool designed by FSPro Labs. Released in 2010, this application has been awarded from various popular places. The application provides the ability to make your folders become invisible to other users. 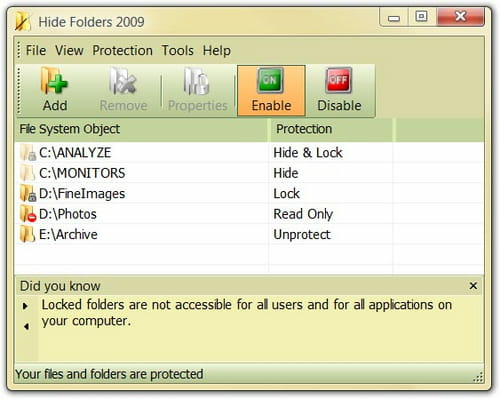 Hide Folders provides the ability to protect your confidential data. Simple and easy to use, the application allows you to password protect your files. Offering an intuitive interface to work with, this application enables you to protect unlimited amount of folders. It allows you to select any file and folder which you want to hide. Latest update on November 21, 2016 at 05:31 PM.